I have also come across investors who believe that stronger companies do not use a crowdfunding platform to raise funds. In this blog, I try to dismantle some of those myths. I also do a comparison of a few of the top platforms. The rating is based on the pros and cons of each from the available information. A caveat, this blog is not a comprehensive list of the equity platforms. The platforms rated here are evolving fast and so the rating may not be a true reflection of the state. The goal is to help investors and founders make an informed decision. But before we dig deep in the individual platforms, let us talk about equity crowdfunding, the myths and the history of it. Crowdfunding is a way of getting support from the “crowd.” That means you, I and all our friends and families could chip in money to help a certain founder, innovator, or startup who is asking for help to be able to continue their idea and work on their new company. As more and more people are getting connected to the internet, it has become easier to reach thousands of people who believe in similar causes. The support may be in the form of a donation to a cause or financial support to build your favorite cooler. Equity crowdfunding is where you can invest in a startup in exchange for equity (share) at the company. Since this falls into the “securities” area, the restrictions are tighter. The companies raising funds are at different stages of the business lifecycle. They may be at the early idea stage with very little traction or they may be at a stage where the startup is generating millions in revenues. Equity crowdfunding a win/win situation -- well, sort of. For the early stage founders, raising capital has always been a difficult task. Banks generally do not lend to businesses at this stage. The world of Angel Investment/VCs is often somewhat shrouded in mystery and is difficult to navigate. Before this current trend began, a founder would have to rely on her contacts to get into the door of an investor. For investors, it has been difficult to get access to high growth companies. These accesses have so far been limited to only a lucky few. They are people who have access to the necessary network are in the right place at the right time. It is important (in the sense if you find wealth creating interesting) to get into these companies. Data indicates that a lot of wealth will be generated in private companies. If you are the suspicious type, look at the following chart. 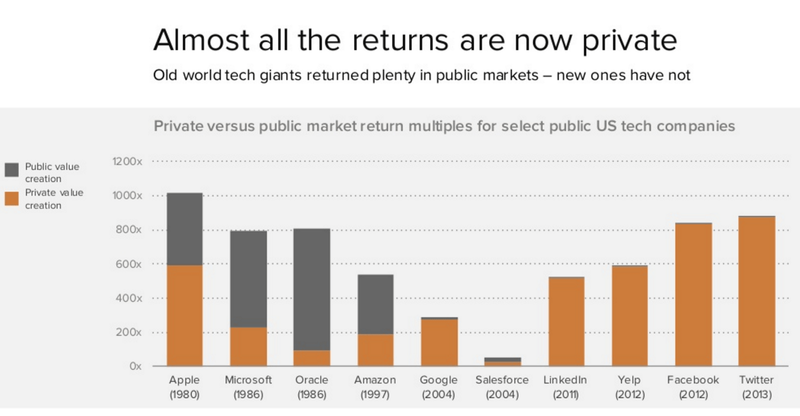 It highlights how the return is shifting from the public to the private markets. The first known equity based crowdfunding platform for startups was launched as a private beta in June, 2009 by Grow VC Group followed by full commercial launch in February 2010. The first US. based company ProFounder launched model for startups to raise investments directly on the site in May 2011, but deciding later to shut down its business due regulatory reasons preventing them from continuing, having launched their model prior to the JOBS Act. One of the first operational equity crowdfunding platforms in the USA was EquityNet, and other early platforms include CrowdCube and Seedrs in the UK. Before June 16, 2015, equity crowdfunding (under Regulation D) was limited to individuals meeting certain net worth and income levels (accredited investors) and was conducted by a licensed broker-dealer. Popular platforms for accredited crowdfunding include AngelList and CircleUp. The first portal operating in the U.S. and geared towards small businesses was EquityNet in 2005, followed by Rock The Post in 2010, now Onevest , SeedInvest was founded in 2011 and FundersClub in 2012. On June 15, 2016 StartEngine was the first to offer opportunities under Regulation A+ of the JOBS Act, which allows both accredited and non-accredited investor to invest in private companies. On May 16, 2016, Title III of the 2012 JOBS Act’s Regulation CF came into effect which allows equity crowdfunding (also referred to as, “Regulation Crowdfunding”), regardless of net worth or income. It must be conducted by a licensed broker-dealer or via a Funding Portal registered with the SEC. Even before the law came into effect, many crowdfunding services launched to fill this role. Early portal Profounder closed before SEC guidelines were released, and equity portal Earlyshares acquired charity portal Helpersunite. StartEngine and Wefunder were two of the first Funding Portals to be approved. Wefunder became the first successful platform, to hit the $1 million rais maximum in the first months following the law coming into effect. A number of other portals have since launched, and many accredited crowdfunding platforms have entered the non-accredited market as well. If you are one of those who gets excited about history and regulations, here is a good primer to know more about the evolution of different types of crowdfunding including equity. How big is equity crowdfunding? If equity crowdfunding doubles every year like the rest of crowdfunding has, then it could reach $36 billion by 2020 and surpass venture capital as the leading source of startup funding. Let's talk about this concept before diving into products and myths around crowdfunding. There are two ways one can invest in a startup on a crowdfunding platform. One is a Special Purpose Vehicle (SPV). Most of the platforms use SPV methods. It helps to pull together small checks from investors and place one large check at the startup under the name of the SPV. This helps to manage cap table for founders. SPV is the killer app of equity crowdfunding. It opened the door of massive scaling. In rare cases where the investor is putting in a large check, she can invest directly in the company without going through SPV and paying carry during exit. Crowdfunding platforms have evolved to offer different types of products. General Funds (like typical VC): This is where you put your money down one time and it gets invested by the lead in a few companies. Like a typical VC fund, you do not get the option to opt out of individual deals. The carry is calculated on the fund. This helps the lead to move on fast moving deals or where the founders are reluctant to share the deals publicly. The difference (compared to typical VC fund) is that there is usually no or lower management fee, so economically much more viable. The funds may vary in focus. It may focus on a particular batch of Y combinator or a particular industry like AI. It may be a fund raised by a lead to investing in the deals that they come across. Syndicate: This is unique to AngelList where someone can build a group of followers who will be willing to invest alongside them on a deal by deal basis or in the general fund if the lead chooses to. The followers have the option to opt out from participating. Company specific funds: A product used by most platforms except AngelList. The company is selected by the deal team of the platform and the investors invest in the fund. This is then pooled and invested as an SPV. The investors have the option to opt out from participating. There are a few myths around equity crowdfunding. Many companies on prominent crowdfunding platforms have a stellar list of renowned VCs as investors. This may range from Andersen Horowitz to Sequoia of the world. The companies that have raised funding on platforms range from names like Instacart to Zenefits to Cruise. Not completely true. Being an accredited investor was a rule to invest on the platforms but with the new regulation, that no longer holds true in all cases. There are platforms where one can invest as small as a few hundred dollars. Not true. The risks are same. Startup investments are risky. Unless you are ready to build a portfolio and lose all your capital, you should not invest in startups. I have covered this in details at one of my previous blog posts here. Not true. The platforms like AngelList uses a syndicated model where you have some of the top names investing in startups like Jason Calacanis, Gill Penchina, Dave Morin and many others. Other platforms also use a number of well-known investors to source and invest in deals. So, How Do The Platforms Stack Up? I have taken a couple of prominent platforms from different countries to show how they stack up in different areas. There are other metrics that can be used to measure the platforms but I thought this would be a good start. I have used 1 to 10 scale (10 being highest) as a tool to compare the relative strengths of each platform. Again, these ratings are very subjective and the intention is to give an idea to investors and founders. AngelList invested $163M in 441 startups in 2015. More than 3300 investors participated at these investments. You can find the details here. Platform model: Crowdsourced. Syndicate-led. Accredited investors. Types of deals: Wide. There are industry specific syndicates focusing on food tech or drones. There are general syndicates irrespective of any industry or maturity of startup. Syndicate leads bring in wide-ranging deals based on their personal/professional network. You can get access to some of the very selective deals that are absent on other platforms (9/10). Terms of deals: Depends on valuation. Companies may be at early stage taking first outside money to late /growth stage. Also the terms of share type, pro rata etc. depends on the negotiation of syndicate lead and where the company is in fundraising. (7/10). Funders Club run a centralized model. There is no individual-led syndicate type structure. The deals to the platform are presented centrally. The company has recently started to get opinions from their active investors before launching a deal on the platform. Platform model: Centralised, i.e., deals presented from one source on the platform. Accredited investors. Types of deals: Limited compared to AngelList. However, the types of deals are varied in terms of industry and stage (7/10). Terms of deals: The predominantly early stage. Also the terms regarding share type, pro rata etc. are usually favorable. (8/10). Access to founders: Almost none. Questions are generally directed via Funders Club (4/10). OurCrowd runs a centralized model where deals are curated by the OurCrowd team. The platform raised $320m in past 4 years and invested in 100 startups with 9 exits. Types of deals: Limited. Covers from cyber security to health to agriculture. (6/10). Terms of deals: Mostly early stage. The terms are well negotiated and usually favorable to investors regarding liquidation preferences, pro rata rights etc. (9/10). Access to founders: There is almost no outside access other than the webinar. (5/10). One of the early equity crowdfunding platforms. Initially catered to accredited investors only but now open to non-accredited investors under Title III. This is the largest platform for non-accredited investors currently. Platform model: Centralised, e.g., deals presented from one source on the platform. Non — accredited investors. Types of deals: Different types. Not only focused on technology startups. (8/10). Terms of deals: Mostly early stage companies. Terms are standard common stocks or preferred shares. (7/10). Access to founders: Limited (6/10). Have a Q&A option. The largest equity crowdfunding platform out of UK. In 2015, the platform raised £83,060,180 ($105m) for 166 pitches. Types of deals: Different types. Not only focused on technology startups. (7/10). Terms of deals: Mostly early stage. Terms of deals vary based on the company and size of the investment. Either Type A or B shares. (9/10). Access to founders: High. A direct call can be arranged. Also, can reach out through Q&A (9/10). There are many other notable platforms that are not included in this blog. Some additional names include MicroVentures, iAngels, Crowdfunder, Equityzen, Syndicate room and CircleUp. Equity crowdfunding serves an important purpose in a startup ecosystem. The regulations, business models are evolving with experience. Despite that, the platforms are scaling fast and will play more important roles in the years to come. Sajid writes regularly on technology trends, life hacks, and startups at many publications including Tech In Asia. He publishes a fortnightly newsletter on these topics. You can subscribe at www.myasiavc.com. You can also get a FREE PDF book of his collection of selected blogs at the site. He is the CEO of Telenor Health, building digital health business for millions in emerging markets. He is also an Angel investor at 150+ companies (Shyp, Hyperloop One, uBeam), Advisor, Director@Founder Institute and Mentor @Endeavor Indonesia. He runs marathons and is preparing for an Ironman. All opinions are his own.